The 1st ever Vegan Group focused on bringing back supply and demand to the Farm Bill. Our goal is to become an official lobbying group and drive political change and reform as it relates to Livestock in this country. First we went Vegan, then we became activists, now we need to centralize and be lobbying members. 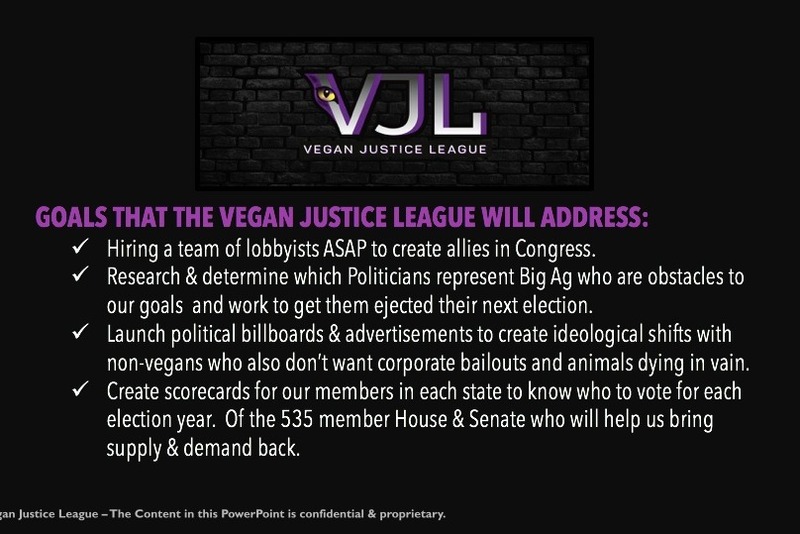 The Vegan Justice League is the 1st ever Crowd-Fund Group to help get us organized and form a Vegan Lobbying Group. Let’s use our Inside Voice Vegans — You may not realize this, but our vegan consumerism is NOT affecting the Meat & Dairy Industry like we thought. I, like you believed we lived in a Capitalist Society, and only recently starting digging in deep to find out that this industry is not affected by Supply and Demand, which is the foundation of Capitalism. I had heard impressive numbers in relation to the growth in the number of Vegans across the country, and this growth spurt that we are seeing should reflect in Animal Production numbers reducing by about a Billion less animals. But in fact, if you look at production, it has increased every year. As you know what this industry does to animals to make money is what some might think EVIL. But in the same vein, their EVIL is much more strategic than we ever thought. Farmers and Farm Investors have manipulated the system to make our Veganism not affect them. To put it bluntly, not 1 less animal dies, despite our Vegan numbers growing and demand going to plant based companies. The reason…The Farm Bill. An immensely fascist bill that has been keeping the meat and dairy industry successful since 1933. The Farm Bill has in fact created a situation where Farmers are incentivized to produce a surplus, because they still will get paid for everything they produce regardless of whether or not there is a ready market for it. 1. They fix/manipulate stock prices --- what this means is that supply and demand does NOT dictate price, they dictate their own price. And at the end of the year, if they fall short, they get paid the difference. 2. The USDA uses our taxes to buy what they don't sell back --- the USDA "redistributes unsold items to food banks" --- Over-produced items more than likely get thrown in the trash from there. 3. Our taxes pay their insurance premiums --- There are lots of insurance that insures Farmers get paid even if the animal dies or production is affected by other "reasons" like weather, surplus, etc. 4. Our taxes pay for them to advertise & do trade shows in other countries --- They are constantly driving more demand by marketing to other countries. In fact, up to 25% of our Pork (Pig) production is exported. 5. Agricultural subsidies cost us, taxpayers about $20 billion a year ----which in turn, makes our taxes pay for what our consumerism doesn't pay for. Learning this shocked me. I have been Vegan for 8 years. I thought my consumerism was saving animals from suffering. I thought that the hours I put into activism and seeing people go vegan was a testament to a future where less animals would endure HELL. So, finding out that this wasn't the case made me go through many steps of confusion, denial and heartache. I spent the 1st month in shock and the last 5 months researching to understand what exactly was going on and how to combat this. To be extra crisp, what is happening now is that our taxes are paying for, back up plans and bailouts to keep the Meat and Dairy Industries profitable and thriving when in reality they are not, they are simply being propped up by us tax payers. The Meat & Dairy Industry have actually applied SO MANY back up plans and a mix of socialist and fascist practices that they have created a situation where they cannot fail whatever happens to the economy or to the demand for meat and dairy. Not failing means no less animals dying. And in fact, farmers are incentivized to have a surplus. This is a disgusting state of affairs; it is a scar upon the American way of life as it directly hits the pockets of hard working Americans. Sept. 2018 - $13 Billion Bailout to animal farmers, crop farmers who supply feed to animal farmers and a few other crops. Plus, the USDA buying 11 to 13 million gallons of milk from dairy farmers for $50 million and "planning" to send it to local food banks. 2016 - The Dairy Industry received $20 Million from the USDA buying back unsold cheese. 2016 - Dairy Farmers dump 43 million gallons of excess milk. In recent years, demand for dairy has fallen. Plant-based milk alternatives are now 13% of the dairy market. These plant-based producers are prospering despite the government rigging the system against them by distorting the market. And what you'll find is that as some headlines discuss how many dairy operations are closing down, the latest news, largely due to the help of these bailouts and The Farm Bill assistance, is that Dairy Production is actually at a record high. <--UH WHAT? HOW DOES THIS MAKE SENSE??? A RECORD HIGH??? I took my research a step further and now understand that this is the United States of Farmerica. You have to understand how this country started with 99% of the original settlers being farmers and the 1st 5 Presidents being Farmers to understand why we are where we are. The most powerful of laws that prevents our Veganism from positively impacting on the number of farm animals slaughtered each year is The Farm Bill which came into existence as the Agricultural Adjustment Act of 1933. At the time, it was designed to help farmers during the Great Depression. They had a giant surplus of Food and the government (using taxes) bought the surplus and began distributing it to feed people in need. At that time, most farmers were small farmers and were aided to not lose their livelihood because it was felt that the agriculture sector was on the brink of collapse. But, it was only supposed to be a temporary solution to deal with an emergency, and instead what came from it, is that Farmers got used to government aid and still to this date are literally incentivized to constantly create a surplus. There are many other aspects to how this bill even became one of the most controversial bills of our time. In the 1960's, because rural districts were no longer the majority, politicians in urban areas were no longer supporting this Farm assistance. So Lyndon B. Johnson, who was born on a Texas Ranch, made a brilliant move, by combining what is important to Urban Politicians (Food Assistance Programs or Welfare) with what was important to Rural Politicians (Farmer Subsidies). Really both are welfare. 1 being corporate welfare and 1 being public welfare. This made the debate and resulted in increases in money for each side, and helped push through more and more increases to Agriculture via simply making it an issue both conservatives and liberals alike or urban and rural politicians alike, seek for more assistance and more money from our taxes to help with it. The hypocrisy though, if you follow The Farm Bill, is that the very Republicans that try to reduce money to public welfare (SNAP) are usually loosening up requirements and adding more "welfare" to these Mega Farmers. And in, fact, small farmers are no longer eligible for these programs anymore, which was the original intent back in 1933. The Farm Bill now IS a welfare program for millionaires and giant agribusinesses. Beyond being Cowboy Welfare and promoting Fascist Farming Practices...it isn't even doing the job it was supposed to do economically. The program keeps food prices high, costing consumers billions, while funneling most of its aid to giant agribusinesses and wealthy farmers. About 75 percent of total subsidies go to the biggest 10 percent of farming companies. Now, I know the history isn't the most exciting topic. But it is important to understand the context. It's long overdue, but it's serious and time we centralize. And the Vegan Justice League will do just that. It's seriously time we play by the same playbook that the Meat & Dairy Industry plays by and beat them at their own game. 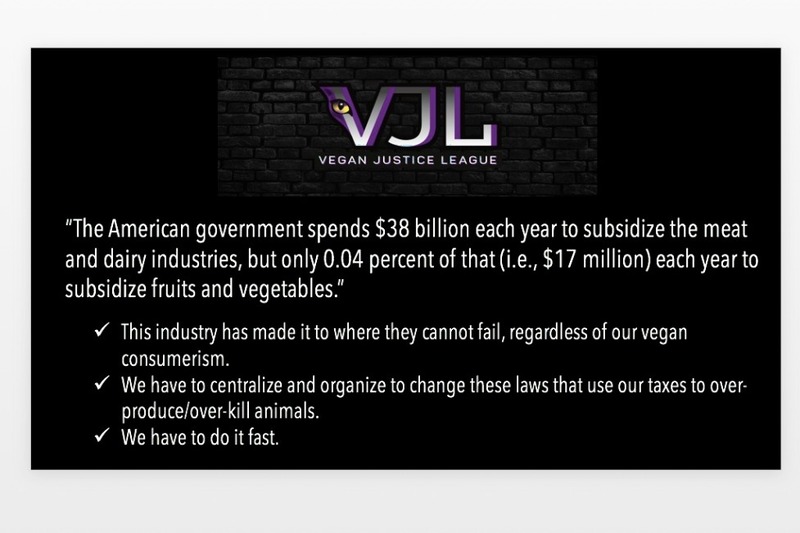 And, again the Vegan Justice League is the solution to do just that. There are now more of us, Vegans in the USA than them, but they are highly organized. How they do this is through Lobbying Groups. I know, I get it, people do not want to get involved in politics, it's confusing. But, we don't actually have to get involved in the politics...if we fund our membership money together, we can hire a team of Professional Career Lobbyists to do it for us. 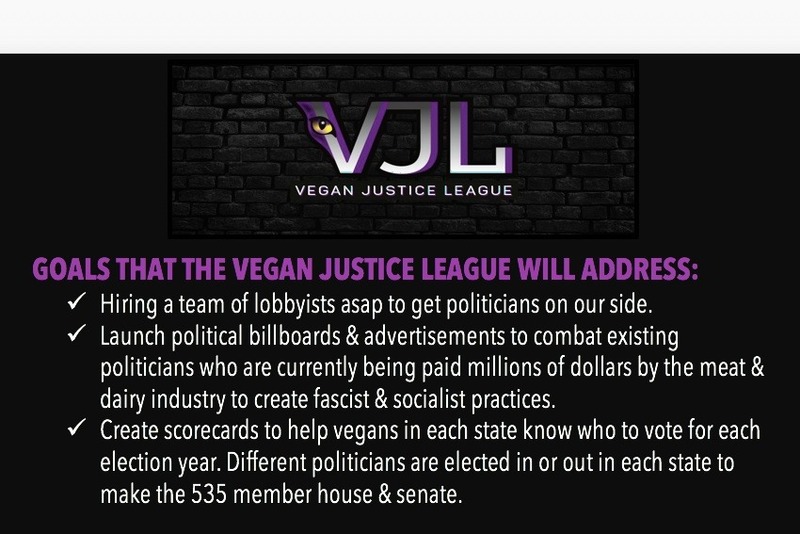 The Vegan Justice League' goals are to use a mixture of traditional lobbying techniques and advertising techniques to support or expose those Politicians who have a conflict of interest. The problem today is most of the public don't even begin to understand beyond their Party Lines, who politicians largest lobbying money contributors are...and how they vote many times against their party lines to support their contributors. What I mean by that, is a conservative candidate taking giant sums of money from an industry that has 78% of their workforce of illegal immigrants, might be talking about building a wall, but might not be paying attention to the umbilical cord of why those immigrants come illegally in the 1st place. Our vegan numbers have skyrocketed in the last 4-5 years with the help of social media and activism. We are now at about 15-19 million vegans in the USA alone. If the same increases are seen in the next 4-5 years, we should be at 10% of the population (1 in 10 people) and one of the LARGEST loyal ideological demographics. If we let the next Farm Bill in 2022/2023 continue to kill more animals, WE WILL HAVE FAILED. WE WILL HAVE FAILED ANIMALS AND OURSELVES. We absolutely cannot let this happen again. How vegan do we feel if we know that our taxes pay for animals to be killed anyways? I know for me, I will not feel like I'm doing everything I can, unless we make this Vegan Lobbying Group the most dominant force in the fight to saving animals!!! 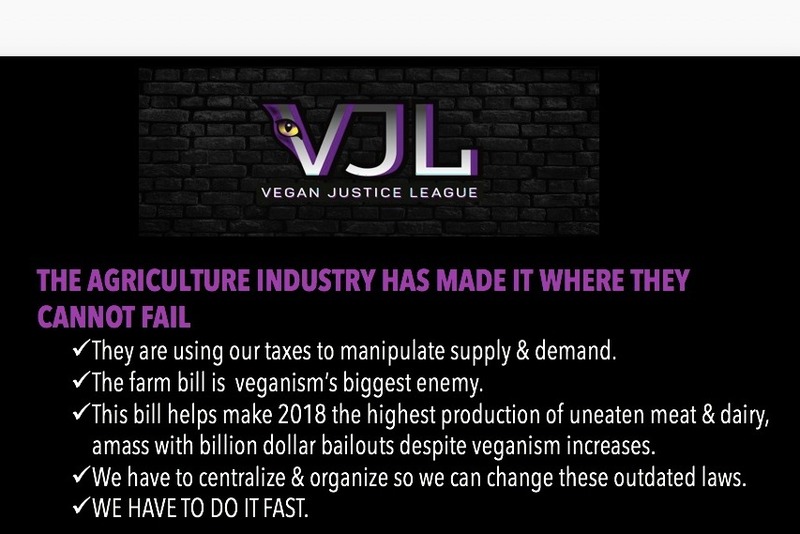 The Vegan Justice League aims to bring supply and demand back to the Farm Bill by 2022/2023 and we have 100 Ambassadors ready to tell that story and help drive membership. Please join us today. We cannot do this without your help. Beyond fighting The Farm Bill, we will continue rolling out member benefits, giving us scorecards on Politicians' policies as they pertain to animals and understanding if they are in Meat/Dairy back-pockets. Let's make our activism count. Let's make the increase in Vegans, decrease animal production by coming together. So that while we march they streets, we also have Vegan Lobbyists marching in the White House. This isn't a pie in the sky dream play. We have meticulously mapped out how to make noise with politicians. Our strategy is to gain votes via the existing politicians. The meat and dairy industry pays for Politicians to vote in their direction, they insert their own Farmer Politicians. So now it's time that we do the same. The current Farm Bill is being signed right now. And thus, the membership money we get is to aim at changing politicians votes for the next one in 2022. But we have to start now, because each election up until then is important to use our membership money to highlight the politicians that we want elected or ejected. Membership is $50 for a year. Donations are also Welcome. But we encourage you to become members and to start thinking about this being a loyal, centralized membership group. So that our voice can grow and continuously be represented. If you donate $50, your email address you will be offered future benefits and alerts. We aim to provide members with emails to provide Scorecard-like info for all of their local politicians to make it easier for us to Vote them in or out. We are a group of 50 Ambassadors. Each dedicating a lot of free time to make this happen in a big way. Many of the Ambassadors also do activism, some even do activism multiple times a week. The loyalty and dedication to animals connects us. If we want a Better World, it's up to all of us. As you know we are busy working to hit our goal and need each and everyone to considering sharing this goal. The Ag Industry has gone uncontested in politics in this country for far too long. Thank you again for everyone who has donated and/or become members. I always want to be forthright and transparent with our donors on our goal. Right now, we are working on deciding how we move forward as a group based on Taxation purposes. Will we be an organization, Union Type Group, education group? Groups that aim to be instrumental in political shifts are bound to many restrictions and laws depending on what type of business or non-profit entity they decide to form. A tax write off non-profit cannot participate in political lobbying activities, so we have hesitated on moving forward with that. We have a call with a legal alliance team that helps groups decide how to define themselves based on their goals and should finalize the decision in a few weeks. With that said, Gofundme requires me, Connie Spence to withdraw sums of money as we raise it. Meaning, they won't let the money sit in the fund. Our members know that we have used some money to cover the costs of Billboards that we launched in October which were fantastic btw, website creation (Plug-ins, developer, hosting) and other operational expenses. Since we cannot pay for Lobbying Representation in the increments as the donations come in nor can we pay for future web development work, we have to save the funds until we hit the goal. And thus, I have to personally withdraw the funds and put them in a 2nd account which will be used until we decide on the Entity we move to (Based on the Legal call). At that time the money will be personally withdrawn by me and pushed into that Business Account or Non-Profit Account. Stay tuned in the next few weeks for an update after we make a decision on what type of entity we form. Today we were interviewed by Jane Velez Mitchell, please consider watching on FB. Share our cause. Every share generates about 1 donation depending on how big your network is. I want to thank everyone that has donated or become a member so far. Thank you for believing in this next level of veganism. We are only 10% to our goal to hire a lobbyist and I'd like to get us motivated to share these videos and information as much as possible to get us to our goal. The new Congress starts work on Jan. 2 and we need a lobbyist there to start creating relationships ASAP. Our veganism was supposed to save animals, but unfortunately our Food System is not based on supply and demand...and it hasn't been since 1933. It's time to change they way we hand over our taxes to corporate welfare that literally is killing billions of animals more than need to die and destroying our planet in the process. Vegan Holiday Roasts are sold out in many cities...but the same number of Turkeys are being killed regardless of our Vegan Consumerism. Why is that? This is why. And this is what we have to do about it. You cannot ignore this anymore. Our intent to go vegan was to save animals. So to save animals, we need to...watch. Learn more about our food system. The reason we went vegan was to save animals and we thought our consumerism did that...but it's not.